Georgina Campbell (centre) presenting the Dairy award to Breda Butler of Cuinneog, with Breda's husband Colm Carney, at the Irish Breakfast Awards. 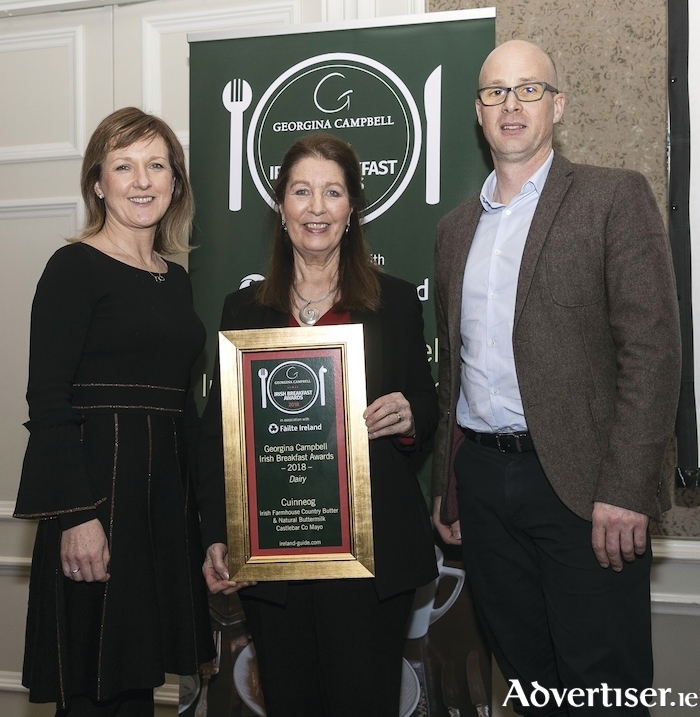 Mayo food producer Cuinneog was announced the winner of the Dairy award for its Irish Farmhouse Country Butter and Natural Buttermilk in the Irish Breakfast Foods category at the prestigious Georgina Campbell Irish Breakfast Awards 2018 in association with Fáilte Ireland. Breda Butler of Cuinneog said: “To receive an award from Georgina Campbell is something very special. I feel the award recognises the many years of hard work that my parents and our team have put into Cuinneog to bring the business where it is today. In their report, the award judges wrote: “Thanks to the Butler family, whose farm near Castlebar, Mayo, is home to some once-familiar dairy products, which had all but disappeared but are now beginning to be produced again – Irish farmhouse country butter and natural buttermilk. Breda’s parents Tom and Sheila Butler began making Cuinneog proper country butter in their family kitchen in 1990 armed with creamery cans and a wooden cuinneog (churn ) in response to local demand for a flavour that was in danger of disappearing. Today, their daughter Breda runs the family business, supplying the Cuinneog lactic butter and its by-product, natural buttermilk, to supermarkets and speciality food shops nationwide. Cuinneog lightly salted butter gets its distinctive colour, creamy texture, and complex, long-lasting, flavour from the traditional production process, which takes four days from start to finish. The cream is slowly heated and fermented, then churned in the traditional way, after which the buttermilk is separated. The butter is then shaped, cut and wrapped by hand. The Cuinneog range is the choice of some of Ireland’s top chefs and best restaurants including Michelin star restaurants Chapter One in Dublin, Aniar Restaurant in Galway and OX in Belfast, as well as The Lodge at Ashford Castle, Knockranny House Hotel in Westport, and Rua, House of Plates, and The Dining Room in Castlebar.